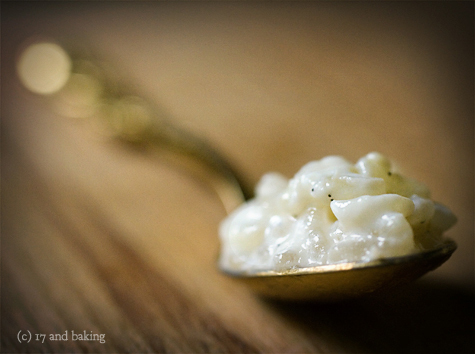 This rice pudding would also be delicious without the tea, and maybe even without the vanilla bean (using 1-2 teaspoons of vanilla extract instead.) 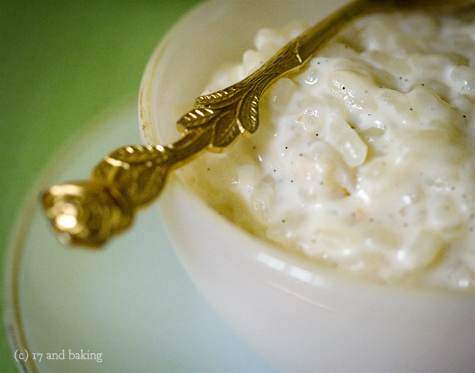 The rice pudding has a wonderful texture to it. Alternatively, I think you could use another type of tea, but you’ll have to figure out exactly how much to use and how long to infuse, depending on how strong it is. 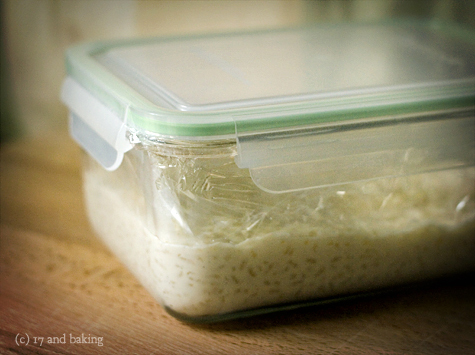 After cooking, the rice pudding should be kept chilled in the refrigerator. It does firm up after leaving the stove, so don’t let it overcook! The jasmine also seemed stronger when the pudding was cold. It was good straight out of the tupperware, but I liked it best warm. I’d put some into a bowl and microwave it for about thirty seconds, and for me it was perfect. Add tea-infused milk, cream, and sugar to the rice. Scrape in seeds from vanilla bean; add bean. 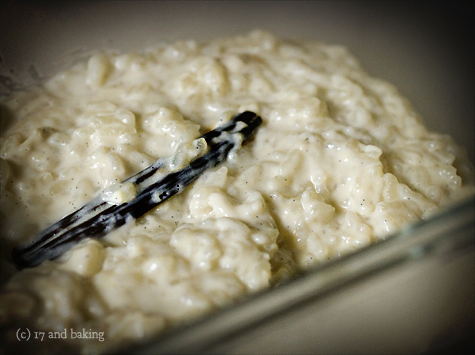 Increase heat to medium; cook uncovered until rice is tender and mixture thickens slightly to a soft, creamy texture, stirring occasionally, about 35 minutes. Remove pudding from heat and discard vanilla bean. Divide pudding evenly among small bowls. Serve warm or press plastic wrap directly onto surface of each pudding and chill thoroughly. Entry filed under: Breakfast/Brunch, Other Treats. Tags: comfort food, creamy, gluten free, jasmine, pudding, rice, Seattle, tea, vanilla, vanilla bean. Mmmm. I made this and it tastes absolutely fabulous. 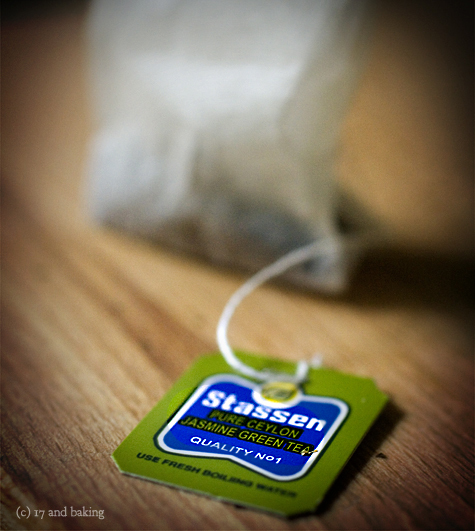 I couldn’t find tea though so I skipped that, but I will definitely add some next time (: Your photography is beautiful by the way! I cannot wait to try this!!! 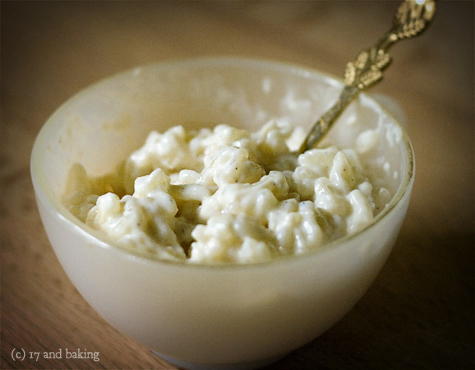 I stumbled upon your blog trying to find a recipe for jasmine rice pudding – as in, pudding made with jasmine rice, not jasmine tea-flavored rice pudding. :-) But I like the ingredient list, and I loved reading your post, so I am going to try this with jasmine rice and chai tea. Thanks for the recipe! 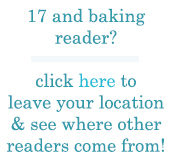 I stumbled on to your blog while looking for a recipe for coffee and vanilla cake. 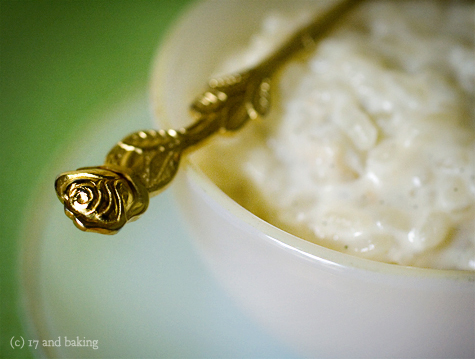 I love using a vanilla pod in rice pudding but have also made it using scented geranium leaves or adding rose water and pistachio. This is so delicious!!! I used lighter products for it and its absolutely yummylicious!!! Thanks for the recipe and good luck with your photography and cooking! Great recipe – what variety of vanilla bean do you prefer? I run a website about making homemade vanilla and I think this recipe would go great with the flavor Indian vanilla beans. Sounds wonderful :-) i love how you described it all…wishing i had bowl right now.